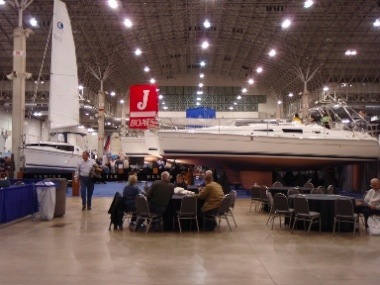 I had never been to the Chicago Strictly Sail show before, so I wasn’t sure what to expect. Chicago is a water loving community and the city has done a very nice job of making the waterfront accessible to everyone. The show in Chicago is held in Navy Pier, which is quite unlike the show Annapolis Boat Show and Strictly Sail Miami that I’ve been to. I heard from many people that I ran into that the show was approximately 25% smaller than it has been in the past and it did seem pretty small. I started my day in the elevator with a man and his friend who had come to the show to buy a boat. He had his camera ready and he knew exactly what he wanted…something around 17 feet that could sleep 4 comfortably. And he was serious. I wonder if he found it?!? Even though the show was smaller, I do think it was a good sign that someone really did want to buy a boat and get into sailing. I made stops at the booths of some of our vendors and had quick meetings. Of course, I had to explain to many of them why Ed wasn’t there. “He’s in Grenada for Grenada Sailing Festival. Poor guy, I know…Well, if it’s any consolation he is racing on a J24.” Luckily, I went last year and it is a great event. Can I say, I’m a little bit jealous though?!? Next up was a meeting with our rep, Nathan McKinley, from Kaenon. I ended up jumping in and helping him out as he became swamped with people wanting to check out the newest Kaenon shades. We’ll be placing an order for Kaenon’s to restock our supply in the next week after selling out of many of our styles at Key West Race Week. If there is anything you want us to order, let us know. Kaenon has many new styles and some great options in the lower price range now as well. The Melges booth was busy with both Harry, Andy and Jim Gluek showing off their beautiful boats. Melges 20 #160 and all of the scows smelled like they had just been pulled from the molds yesterday! I had my first opportunity to race on the Melges 20 at the first event of the Miami Melges 20 Winter Series in Coconut Grove in December and can’t wait for my next chance! The boat is a blast and feels a lot like the Melges 24, but at the end of the event, I could still feel both of my legs! I’m definitely sold…now to figure out how Sail22 will get one. If you are offered a chance to sail on one of these great little boats, find a way to make it happen! Spinlock has one of my favorite products of all time, the Spinlock Knee Pad. They have saved my knees so many times on the Melges 24 and Farr 40. If you don’t have them, I highly recommend them. They have been upgraded a bit with a new higher density foam and are slightly more ergonomic. I am putting in an order this week to replenish the Sail22 stock for sure! Their Deck Vests are definitely the best if you are looking for an inflatable PFD and their clutches and jammers have new options for the jaws now too. A great group from the Maxinkuckee Yacht Club met at the show and visited our very own Rear Commodore, Matt Grant of SailRite. We discussed our upcoming season on Lake Maxinkuckee and then we headed to dinner at Ben Pao’s. Excellent food and company!